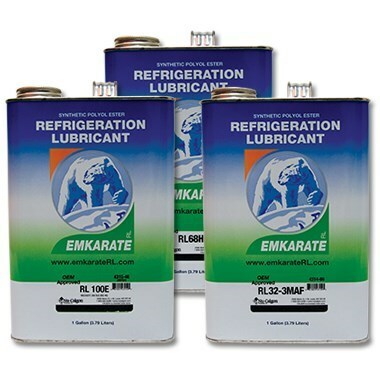 The Emkarate family of lubricants is a wide range of polyol ester refrigeration oil products. They are designed specifically for use with HFC refrigerants, developed to meet the performance demands of the refrigeration industry. This superior performance is achieved with base fluids that are specifically formulated to deliver optimum performance with minimal additive levels. The requirements of today's refrigeration and air conditioning compressor lubricants are complex. They must be compatible and miscible with the HFC refrigerants, and they must be compatible and miscible with CFC's and HCFC's as well as mineral and alkylbenzene oils. Polyol ester lubricants meet these needs, and the EMKARATE RL line is the preferred choice. Working in close collaboration with compressor and system manufacturers, these OEM-approved POE lubricants cover a wide viscosity range from 7 cSt (35-40 SUS) to 220 cSt (1100 SUS) to suit most applications. The lubricants have excellent thermal and chemical stability, and are compatible with a wide range of elastomers, polymeric materials and other materials of construction. Additionally, then higher viscosity index is an indication that their effective viscosity will not change drastically with the wide swings in temperature seen by most typical refrigeration and air conditioning systems. They are the preferred choice for servicing and retrofitting existing equipment as well as for OEM charging.